Hasbro held their New York Toy Fair event today and they included information on all of the upcoming product from their various lines. They will have new toys from the upcoming Marvel movies and Solo: A Star Wars Story, which will be released on April 20th. Hasbro Pulse will be releasing an app that will allow you to scan a product’s UPC code and add it to an inventory of toys. The app will have information going back 10 years and will have G.I. Joe information added to it at a later date. The Mighty Muggs line will expand to include Transformers and My Little Pony characters. The upcoming wave 3 of Star Wars Muggs will be from Solo and haven’t been announced yet. Wave 4 will have C-3PO, Captain Phasma and Maz Kanata. There’s a Battle of Crait 4-pack from The Last Jedi that includes Rey, Rose, First Order Driver and Gunner and is shipping now. Role Play items to include new Bladebuilders and a Black Series replica baton. The baton will open and have lights and sounds. The new Force Link Band 2.0 includes Bluetooth and can be updated for future releases. The numbering for the Vintage Collection will pick up where the previous line left off and will be sequential. The Imperial Assault Tank will release in August. Final pricing hasn’t been announced but there’s a rumor that it’ll be in the $80 range. Finally, Hasbro announced HasLab, a new crowdfunding platform to support items fans really want made. First up will be a 4′ long Jabba’s Sail Barge. It will require 5,000 backers by April 3, 2018 and will be priced at $500. 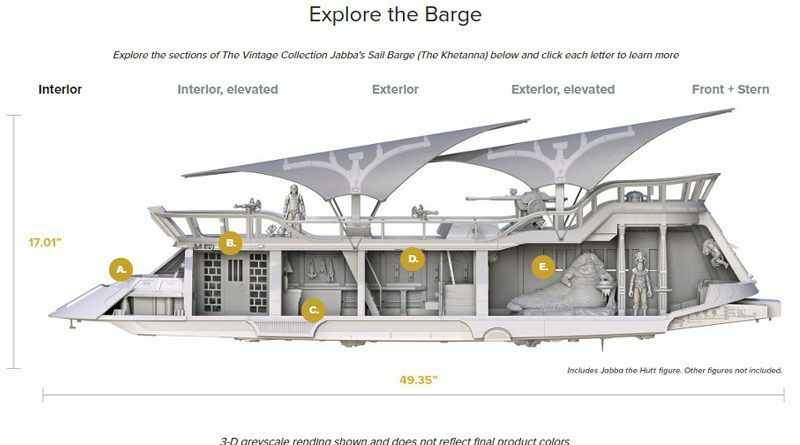 Details include Jabba’s room, a galley, cell, cockpit, smuggler compartment, and will include a Jabba the Hutt. Head over now to hasbrolab.com.